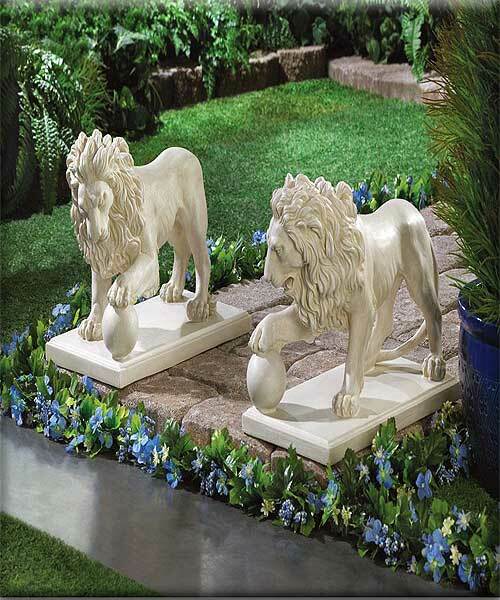 Stock# - 15158 Regal Lion Statue Duo - With paw perfectly poised atop an orb, this matching pair of magnificent lion statuary will guard your garden or walkway and add a regal flair to your kingdom. Each is 16" x 8 1/2" x 12" high. Poly resin. 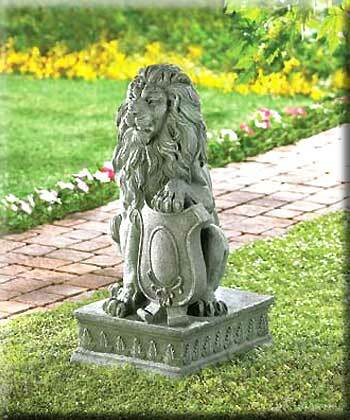 Stock# - 38624 Statue Lion Guardian - With his mighty paw placed atop a crested shield, a regal lion surveys all who approach the door to your "castle". Inspired by the centuries-old stone carvings found in castles and cathedrals throughout Europe, this impressive statue makes a bold historical statement and lends distinction to your entryway or garden! Fiber resin. 12 1/4" x 14 1/8" x 25" high. 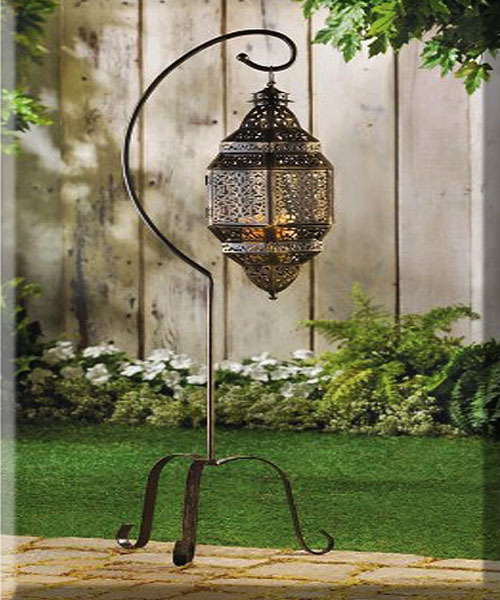 Stock# - 12575 Moroccan Candle Lantern Stand - Capture the drama of a deep desert night with this enchanting standing lamp! Free-swinging lattice lantern cage lets candlelight create shifting designs that dazzle and delight. Iron. Candle not included. May Require Additional Freight Charge. , lantern: 8 1/4" x 7 1/2" x 18" high. 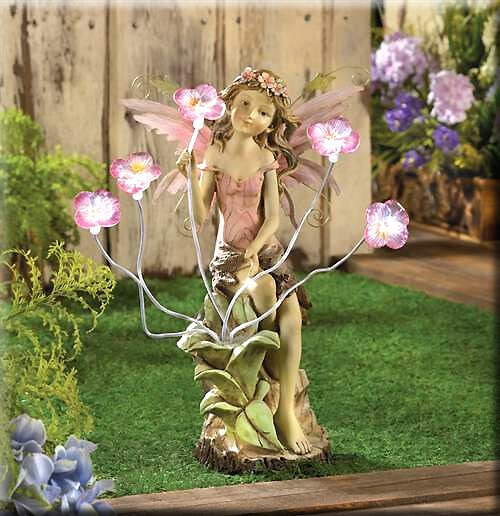 Stock# - 12967 Verdigris Garden Centerpiece - Fantastic three-in-one decoration adds liveliness to any garden! 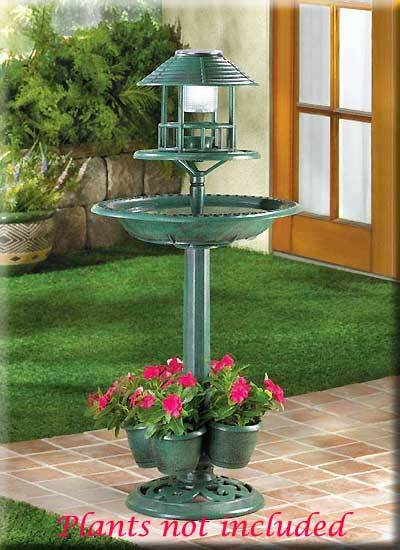 Lightweight yet sturdy enough for years of enjoyment, this faux-metal treasure brings together a generous birdbath, a solar night light, and a place for four of your favorite plants. Plastic. Plants not included. One AA battery included. Some Assembly Required. 17" diameter x 36 1/2" high; each planter is 4 3/4" diameter x 3 3/4" high. 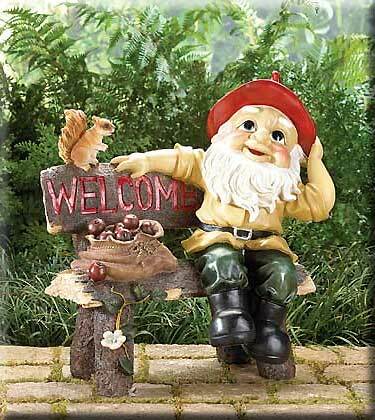 Stock# - 39265 Garden Gnome Greeting Sign - An apple-cheeked forest gnome perches perkily on his hand-hewn bench, grinning a greeting to one and all. He's even brought along a furry-tailed pal to help with his duties as host! A witty and winsome way to welcome visitors to your home with a darling dose of fairy-tale charm! Polyresin. 13 3/8" x 9" x 14" high.